One of the cornerstones of SEO (search engine optimisation) is building good quality website backlinks. These are websites and web pages that have links to your website and usually have the beneficial effect of boosting your search engine rankings. Recently a senior Google search engineer was on a live Q&A event and was asked to name the top ranking factors. He simply stated three: content, Google Rankbrain and backlinks. Right from the early days of Google, backlinks have been an important factor in the way their algorithm judges where to rank a website. If your website has many backlinks from good quality websites with a wide variety of related pieces of anchor text then you are likely to rank high for those keywords. If your website has a low number of backlinks, backlinks from unrelated websites or backlinks from poor quality websites then this will do nothing or incur penalties on your Google ranking. These so-called ‘toxic’ backlinks can lower your ranking or get your website delisted if Google judges attempts at spamming using black hat seo techniques such as Private Blogging Networks, link farms or irrelevant websites and links from low quality websites. 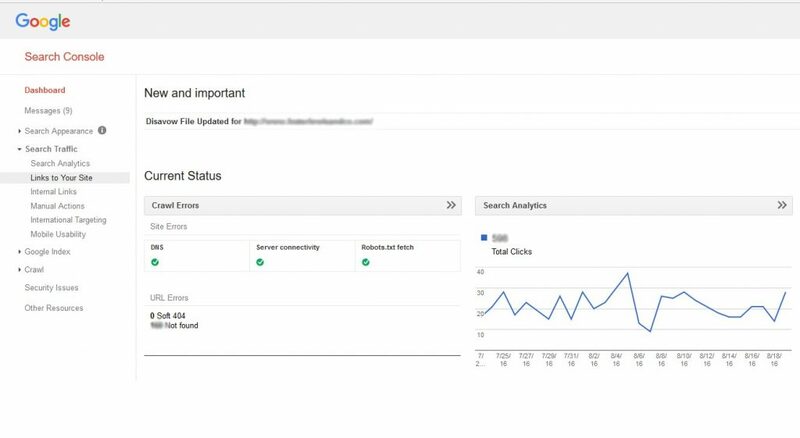 In addition there are free tools such as Moz’s open site explorer, SEO review tools or the one we’re detailing here from Google Search Console. 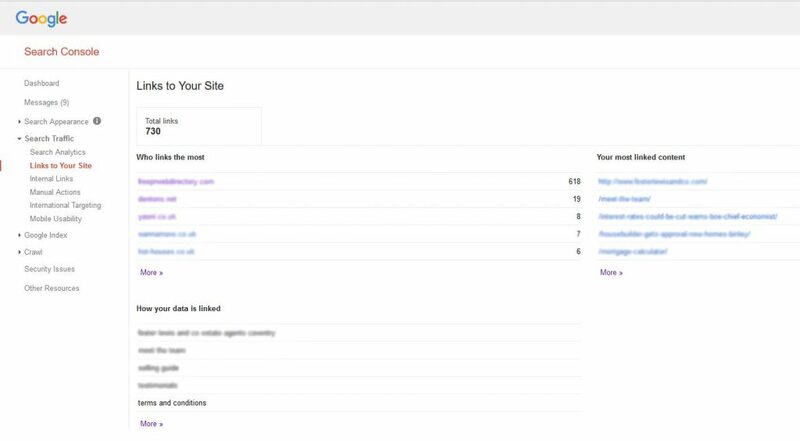 First of all you will need to sign up to Google search console and add your website address as a property. You will need to verify ownership of the website and this is best done by your account also owning the Google Analytic account for the website. Alternatively you can add upload an html file with a name specified by Google. Once your account is verified you can start looking at the vast amount of data that Google Search Console generates for your website. One of the most important areas is backlinks detected by Google. Go to Search Console and click on the website you are reviewing. Then go to Dashboard > Search Traffic > Links to Your Site. Clicking on ‘More’ in each case will enable you to view the full table and then download a csv file which you can import into excel and start the important job of checking the web pages that Google has detected as including a backlink to your website and when it was detected. Setup your spreadsheet so you can write comments and maybe use conditional formatting so you can see at a glance on which websites you need to take action. Is the website relevant to your industry or topic of your website? Could anyone think that a website link is the result of artificial link building or PBN. Is the link from a low quality website for example, not updated regularly, thin on content or has lots of annoying pop-ups or links to other poor websites. Can you find a current company or individual that owns the website – try a search for their name on Google. The website contains an unnaturally high number of links to the same page on your website indicating it is probably in a low ranked area of the website. Email the website to request that they remove a link to your website – don’t hold your breath as this can take some time. Use the Google disavow tool with care and be sure that you want a particular backlink disregarded by Google and assess the effect on rankings and traffic when this is done. Often you have no control over who links to you but you need to check website backlinks regularly.